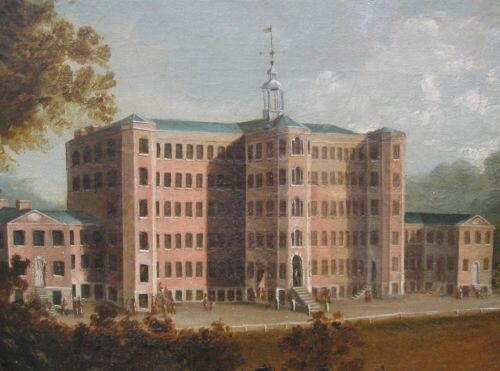 Samuel Oldknow (Jane Michael writes) built his Mill at Mellor because of the natural resources the site offered him. These natural resources were the product of millions of years of geological history. This short account explains how they formed. The current countryside looks green/yellow/red/brown. There are many trees and other vegetation. There are hills and rivers. A long time ago – well before the dinosaurs roamed the earth – about 315 million years ago (Ma), the land probably also looked green. However, there were no houses, no telegraph poles though it was probably cloudy. And it would have been a lot warmer because Britain was located somewhere round the equator on a tectonic plate which was moving northwards. This was towards the end of the Carboniferous period (which stretched from 359Ma to 299Ma), at a time known in the UK as the Namurian/Westphalian boundary. The Namurian epoch used to be called the Millstone Grit and the Westphalian called the Coal Measures which reflect the types of rock found in each. 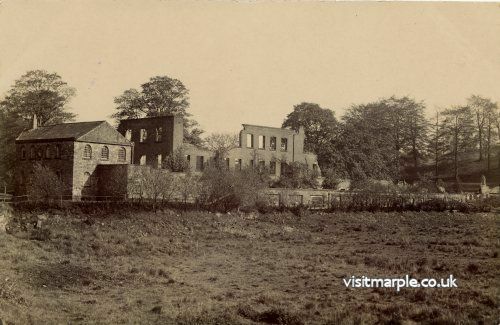 Mellor Mill was built by Samuel Oldknow in 1790-92 and was burnt out in 1892. It was the largest cotton mill of its time and the template for the architecturally impressive mills that spread through the region. 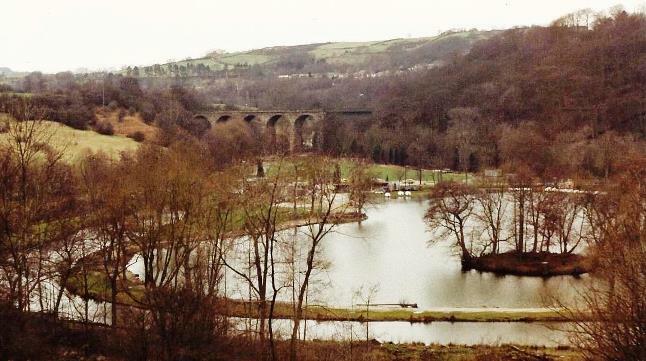 Following Oldknow's diversion of the River Goyt, it was the final flowering of water power, with large stone-built tunnels for water and drive shafts. The site now looks like wild woodland until you walk in and find the deep holes of the wheelpits and cellars. In 2009, excavations at the south end of the mill, in the car park near the millpond, uncovered mill walls, steps down to a cellar with two blocks for mounting machinery and bits of a singeing frame (for removing projecting hairs from a cotton yarn to make it smooth). Subsequently walls at the north end of the mill have been uncovered. In 2011, a grant from the Association for Industrial Archaeology enabled 120 tons of debris to be cleared from the Wellington wheelpit under the centre of the mill and open it for public view. Volunteers have continued to clear the cobbled area in front of the mill, a stable for visitor's horses under the central projection and the 100-metre tunnel for the drive shaft from the Waterloo wheel. There is more than the mill. Nearer the river, there is the Waterloo wheelpit, the sites of workshops, stables, and gasworks and a tunnel under Lakes Road to Oldknow's mansion and garden. The heritage also includes Bottoms Hall, with Oldknow's model farm and the apprentice house, and the transformation of the south millpond into the Roman Lakes Leisure Park. In September 2012, after two unsuccessful bids, HLF granted £45,000 towards the development stage of the porject "Revealing Oldknow's Legacy: Mellor Mill and the Peak Forest Canal in Marple". The main bid, to be submitted in May 2013, will be for £1.2M jointly with the Canal and River Trust, reflecting Oldknow's promotion of the canal. If approved, the whole industrial complex will be uncovered and opened to the public, plus an innovative approach to digital learning as well as more traditional ways of displaying information. 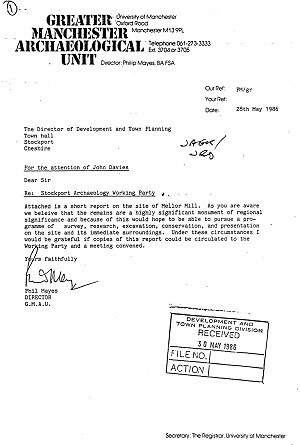 1986 Letter from Phil Mayes, DIRECTOR G.M.A.U to John Davies The Director of Development and Town Planning SMBC. Attached is a short report on the site of Mellor Mill. As you are aware we believe that the remains are a highly significant monument of regional significance and because of this would hope to be able to pursue a programme of survey, research, excavation, conservation, and presentation on the site and its immediate surroundings. Under these circumstances I would be grateful if copies of this report could be circulated to the Working Party and a meeting convened. Samuel Oldknow of Stockport acquired the Bottoms Hall Estate in 1787 and acquired other adjoining properties in the years following. Between the years 1790/1792, Oldknow constructed Mellor Mill on his estate in the valley of the River Goyt together with ancillary buildings, mill ponds and leats. The history of the mill has been outlined by Unwin (1920) and by Ashmore (1977). The University of Manchester Archaeological Unit (UMAU) and Mellor Archaeological Trust (MAT) carried out an archaeological evaluation in April/May 2009 at the site of Mellor Mill, Marple Bridge, Stockport (centred on the National Grid Reference of SJ 9670 8845). The evaluation was carried out as part of the Mellor Heritage Project (MHP); a three-year Heritage Lottery funded community archaeology project. A photographic survey and visual inspection of Mellor Mill's wheelpits, drive and access tunnels was also carried out during the works. Mellor Mill was built between 1790 and 1793 and was part of a large estate centred here, owned and first developed by the important industrialist Samuel Oldknow. The mill itself measured c.400 feet long and 42 feet wide with six stories and was one of the largest water-powered mills in the country when first built. Oldknow was a manufacturer of cotton, and in particular muslins, who later became a partner to the significant figure of Richard Arkwright Jnr. After Oldknow's death, the estate and mill continued working in cotton manufacture until a disastrous fire in 1892 which partly destroyed the main mill building and caused the mill to cease operations. The mill stood as a ruin until the 1930's when demolition of the remaining above ground remains took place. In early November 2010 a group of volunteers spent five days attempting to find some trace of the main structure of the mill at its northern end. Initial clearance of a section soon found an area of laid setts and after extending it further west it was found to partly overlay brick walling. The team concentrated on this and found a square brick structure with walls four bricks wide and a central area a little under two meters square. Following this down it was found to be ½ meter deep (six layers of brick) with a brick floor. A small drain was located in the northeast corner. The lower fifteen centimetres of the fill overlying this floor was primarily composed of coal dust. Above this was a quantity of brick rubble and it was noted that many of these bricks were curved, possibly indicating the remains of a barrel roof. From the eastern face a further wall appeared to extend for a short distance and this was found to be a double wall with a void between them. Examination of the 1898 O.S. map of the area shows “W.M.” in the area where we were working. Does this mean we had uncovered the remains of a “weighing machine”? Quite possible. In which case the main mill building is still to be pinpointed. The mill was originally water powered and it seems that water remained the main source of power throughout its life, but a pair of auxiliary compound steam engines built by Goodfellow of Hyde with an associated boiler was added in about 1855. Steam power was intended for use in the event of the river running low, and the engines and boiler were housed in a purpose built building at the north end of the main mill. The position of this building has been identified and there are several substantial vertical steel rods and stone grooved blocks remaining in place that would have secured the engines. There are also the remains of stone walling at the rear now overgrown by a large sycamore tree, and behind that the almost buried entrance to the flue that carried the smoke from the furnace to the chimney, which was situated some distance up the hillside. On our last day, a small area south of our excavation was cleared and a cobblestone surface revealed. It is likely that this is part of the yard in the front of the main mill building. Thanks are due to owner Bernard Sewall for permission to excavate and to the volunteers who endured some uncomfortable conditions during the week. One full day was lost due to heavy rain. Copyright © 2019 Mellor Archaeological Trust. Registered Charity: 1081602. All Rights Reserved.